Pictured below is a concession trailer vinyl wrap we recently completed onsite at Lancaster Archery Supply’s Leola PA warehouse. This 3M certified wrap was printed with our 3M MCS latex ink system which helps the adhesives bond their best to the trailer surfaces. This trailer will be touring the US and looking great for years. Next up will be to wrap their GMC dually pickup. Stay tuned! A bit about our client: Since 1983, Lancaster Archery Supply has been known worldwide for serving target archers and bow hunters with integrity, caring and excellence. Our customers have made us the largest archery-only distributor in the US. 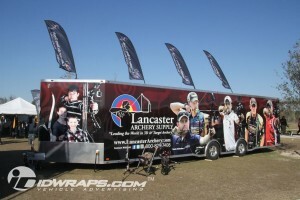 Come see our new LAS Express Trailer at a national archery event, visit us in Lancaster, PA or see our website at www.lancasterarchery.com. Get your free vinyl trailer wrap quote at www.idwraps.com. Nationwide service and installation available.